Philip provides financial support and advice to a full range of business entities from large organisations to small growing businesses. With over 25 years' experience he ensures business issues are solved quickly and efficiently. He has a particular focus on UK parent and subsidiary companies of international groups. Providing practical advice and on the ground support to global organisations. Philip has specialist expertise in business systems which he often brings to bear in his advisory work. His combination of business and technology skills means he is well positioned to help organisations streamline financial processes and save costs. Philip heads up our accounting systems and services department. His team provide management reporting, accountancy services and support using cloud technology and online accounting. Twinfield is a European market leader in online accounting and Goodman Jones were the first UK firm to introduce Twinfield, led by Philip. He has spearheaded the firm’s use of a range of innovative technologies internally and as a result Goodman Jones were winners of two Accountancy Age Awards. Philip is invited as a speaker at various industry events and conferences focused on improving operations and delivering greater value. 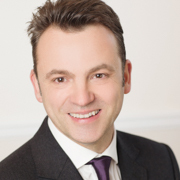 Philip qualified as a Chartered Accountant in 1993 after completing a degree in Mathematics. He worked in an international firm before joining Goodman Jones in 1998 and became a Partner in 2001. Goodman Jones not only understood the technology but by tapping into their understanding of international businesses we now have financial reporting that is clear, fast and accurate and sets us up for future growth. Philip is a keen traveller and the places he has visited include Australia, Europe, North America, South America and South East Asia. At the slightest opportunity he packs his family off for a trip to the great outdoors.